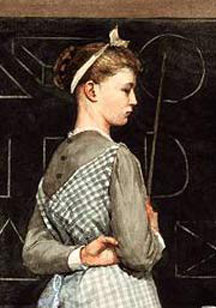 Winslow Homer, Blackboard , 1877, watercolor on wove paper. Blackboards made of slate were used in the United States from 1801 through the late middle twentieth century. They can still be found in use, though they have been largely replaced, first by green boards and then by whiteboards and electronics. Though replaced, they remain a fixture of American speech: "like fingernails on a blackboard," "wipe the slate clean," "a slate of candidates," and as in this article "blank slate." The blackboard has returned lately, not in educational institutions, but in commercial settings, though it is (usually) made of something other than slate. You can find blackboards in eating and drinking establishments, and in markets, where they are used to advertise special offerings. See this video from CBS News about an artist employed by Whole Foods Market to create blackboard signs. The Winslow Homer painting is at the U.S. National Gallery of Art, a gift (partial and promised) of Jo Ann and Julian Ganz, Jr., in Honor of the 50th Anniversary of the U.S. National Gallery of Art. What parts of their jobs do they like most? Least? How are they doing on their most important tasks? Are they in trouble in anything they're doing? Are they concealing any of those troubles? How do they plan to resolve the problems, if there are any problems? We don't usually speak candidly about these things. We might have a few close confidants, but for most of us, they number much less than 30. Most of us talk honestly about these things only outside of work. At work, we're mostly blank slates to each other. Well, not totally blank. When we lack information about other people's motives, concerns, worries, or yearnings, we tend to speculate. We just make it up. Often, we believe we know what's going on for the people around us. And many of us just make it up without realizing we're making it up. Many of us are working with semi-fictional or mostly-fictional representations of each other. It's risky, because the judgments and assumptions people make about each other are usually wrong. That collaborations work as well as they do is almost miraculous. What can you do about this? When you can, help others avoid speculating by filling in the blanks about yourself. When you're in serious trouble, so serious that it's obvious to many, denying its seriousness just isn't credible. "Everything is under control" isn't believable when the roof is falling in. Acknowledge the problems. Acknowledge that some aren't yet being addressed effectively. Say something about how you plan to change that. Detail isn't required. Demonstrating a grasp on reality is required. If you have plans with regard to your area of responsibility, be sure your boss knows about them. Keeping your plans to yourself leaves opportunities for anxiety and worry. One exception: if your boss is a micromanager, openness about your plans invites yet more micromanagement. Be judicious. just isn't crediblecan't consistently hide personal problems from everyone. The word gets out. Maybe people can't tell exactly what's troubling you, but they can tell that something is. Waiting to be asked, or denying that anything is wrong when you are asked, only adds to others' concerns. By contrast, preempting the inquiries by disclosing just a little information usually dampens curiosity. To those rude enough to demand details, you can respond, "I'd rather not say more." Since they probably wouldn't be satisfied with any level of detail, you'd eventually reach that point anyway. The sooner the better. Would you like to see your comments posted here? rbrenCPmpJTyAXXRImcHTner@ChaccofUxeadFIAOHYBkoCanyon.comSend me your comments by email, or by Web form. I offer email and telephone coaching at both corporate and individual rates. Contact Rick for details at rbrenbavyLdkdtUxVvTOwner@ChacntrAkMhVfypWzIvEoCanyon.com or (650) 787-6475, or toll-free in the continental US at (866) 378-5470.